Iron Fencing is a popular fence material option; wrought iron fencing has been a sign of luxury and lasting beauty for years. 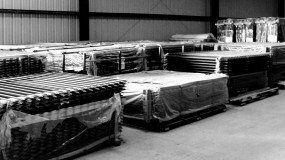 Fence Supply Inc. offers an extensive selection of stock and custom iron fence panels and driveway gates. 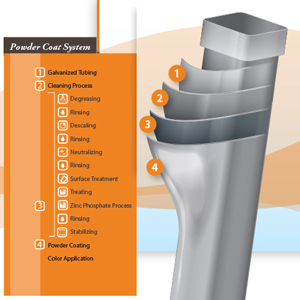 We can help in your selection process for steel fencing panels or decorative metal projects. Ornamental metal driveway gates are a great addition to any home or business. We have the supplies and resources to help you build a long lasting wrought iron style fence or estate driveway gate to enjoy for years to come. 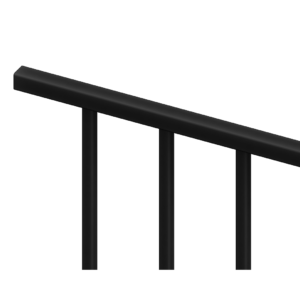 Pre-galvanized, powder-coated black iron fence panel with 5/8" X 5/8" pickets, 1" X 1" rail and 3 7/8" spacing between pickets. Our Yukon iron fence panels are like your favorite pair of blue jeans- they’re classic and they never go out of style. Each iron fence panel features two horizontal 1" x 1" frame rails and 5/8" x 5/8" iron fence pickets spaced 3 7/8" apart, which means this panel meets most pool fence codes and works well for containing most dogs. We also carry dog bars to place at the bottom of your iron fence panel in case you have small dogs. The Yukon iron fence panel has a powder-coated black finish, and is pre-galvanized for maximum durability and ease of maintenance. These iron fence panels are versatile and look great in a wide range of uses, including pool fences, dog runs, backyard fences, and commercial and business properties. Yukon iron fence panels come in 3′, 4′, 5′, and 6′ heights and are 94" long. Installation is a cinch; simply sink your fence posts (sold here) in concrete. You can then weld the panels directly to your posts or use mounting brackets to easily attach your fence panels to the poles. 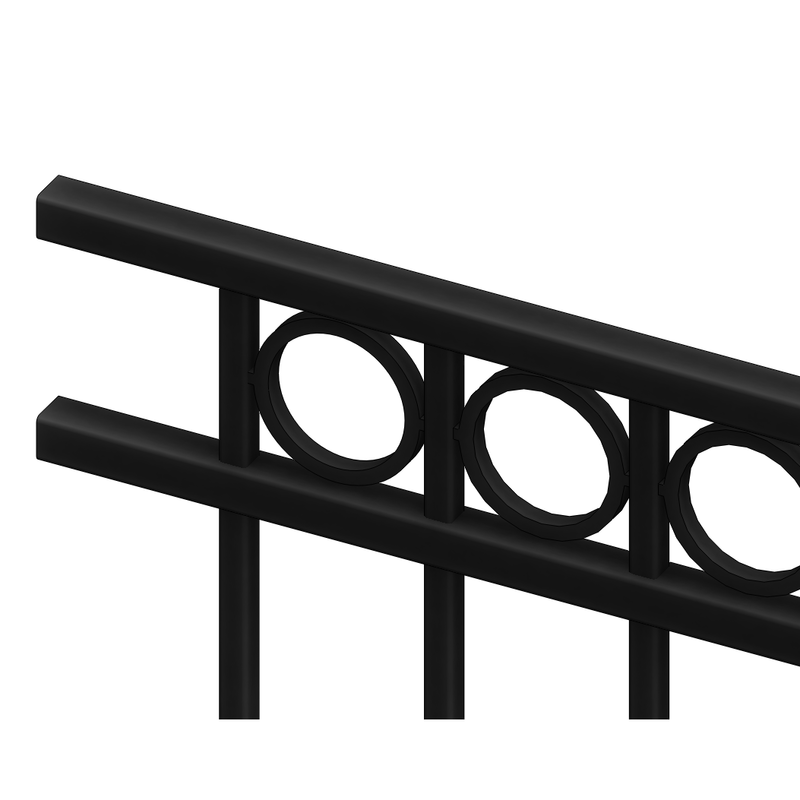 Pre-galvanized, powder-coated black iron fence panel with 5/8" X 5/8" pickets, 1" X 1" rail and 3 7/8" spacing between pickets. With our Regal iron fence panels you can finally have the fence that you want! We have left the top of our Regal iron fence panels unfinished, so you can let your imagination be your guide as you select the perfect finials to complete your masterpiece. You can choose from fleur-de-lis, quad flare, Spanish spear, or triad point to finish your fence the way you want it. Shop for your finials here. Each iron fence panel features two horizontal 1" x 1" frame rails and 5/8" x 5/8" iron fence pickets spaced 3 7/8" apart, which means this panel meets most pool fence codes and works well for containing most dogs. We also carry dog bars to place at the bottom of your iron fence panel in case you have small dogs. The Regal iron fence panel has a powder-coated black finish, and is pre-galvanized for maximum durability and ease of maintenance. These iron fence panels are versatile and look great in a wide range of uses, including pool fences, dog runs, backyard fences, and commercial and business properties. Regal iron fence panels are designed to meet any needs, and are limited by only your imagination. 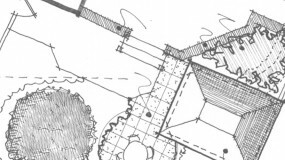 They come in two lengths, 42" and 72", so they are perfect for conforming to irregularly-shaped property lines. 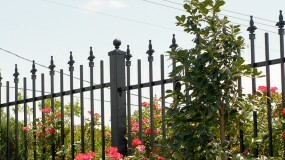 Regal iron fence panels come in 4′, 5′, and 6′ heights. Installation is a cinch; simply sink your fence posts (sold here) in concrete. You can then weld the panels directly to your posts or use mounting brackets to easily attach your fence panels to the poles. Then attach the finials of your choice, or leave the fence-tops unadorned, and you are good to go! Pre-galvanized, powder-coated black iron fence panel with 5/8" X 5/8" pickets, 1" X 1" rail and 3 7/8" spacing between pickets. When you want to add a touch of classy, modern flair to your property, you don’t need to look any farther than the Denali iron fence panel. Each iron fence panel has a row of 4" solid steel rings between two 1" x 1" horizontal rails running across the top, with a horizontal 1" x 1" frame rail on the bottom and 5/8" x 5/8" iron fence pickets spaced 3 7/8" apart. The Denali iron fence panel meets most pool fence codes and works well for containing most dogs. We also carry dog bars to place at the bottom of your iron fence panel in case you have small dogs. The Denali iron fence panel has a powder-coated black finish, and is pre-galvanized for maximum durability and ease of maintenance. These iron fence panels are versatile and look great in a wide range of uses, including pool fences, dog runs, backyard fences, and commercial and business properties. 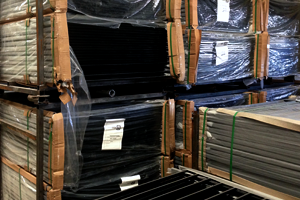 Denali iron fence panels are 5′ high and are 94" long. Installation is a cinch; simply sink your fence posts (sold here) in concrete. You can then weld the panels directly to your posts or use mounting brackets to easily attach your fence panels to the poles. 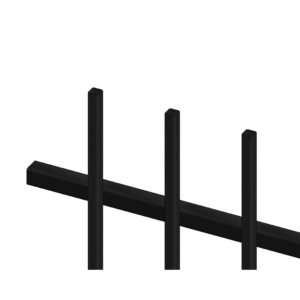 Pre-galvanized, powder-coated black iron fence panel with 5/8" X 5/8" pickets, 1" X 1" rail and 3 7/8" spacing between pickets. Our Summit iron fence panels add an element of security to your home while still looking great. 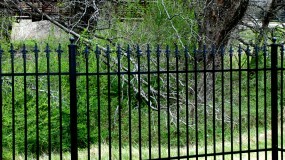 Each iron fence panel features a 6" spear-point design that is virtually impossible to climb over. These iron fence panels will give you and your family peace of mind, as well as the satisfaction of having a beautiful iron fence. Each iron fence panel features two horizontal 1" x 1" frame rails and 5/8" x 5/8" iron fence pickets spaced 3 7/8" apart, which means this panel meets most pool fence codes and works well for containing most dogs. We also carry dog bars to place at the bottom of your iron fence panel in case you have small dogs. The Summit iron fence panel has a powder-coated black finish, and is pre-galvanized for maximum durability and ease of maintenance. These iron fence panels are versatile and look great in a wide range of uses, including pool fences, dog runs, backyard fences, and commercial and business properties. Summit iron fence panels come in 4′, 5′, and 6′ heights and are 94" long. Installation is a cinch; simply sink your fence posts (sold here) in concrete. You can then weld the panels directly to your posts or use mounting brackets to easily attach your fence panels to the poles. 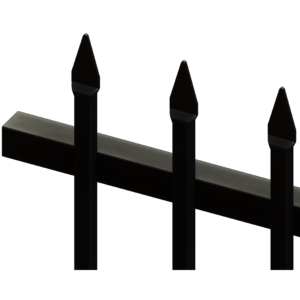 Pre-galvanized, powder-coated black iron fence panel with 3/4" x 3/4" pickets, 1 1/2" X 1 1/2" rail and 4" spacing between pickets. When you need to provide security for your business without sacrificing appearance, our Summit commercial iron fence panels are the way to go. These heavy-duty iron fence panels provide peace of mind for your investment. Each iron fence panel features a 6" spear-point design that is virtually impossible to climb over. They’re tough and intimidating, but they still look classy and inviting to prospective clients! Each iron fence panel features two horizontal 1 1/2" x 1 1/2" frame rails and 3/4" x 3/4" iron fence pickets spaced 4" apart, which means this panel meets most pool fence codes. We also carry dog bars to place at the bottom of your iron fence panel if you have dogs. The Summit commercial iron fence panel has a powder-coated black finish, and is pre-galvanized for maximum durability and ease of maintenance. These iron fence panels are versatile and look great in a wide range of uses, including pool fences, dog runs, backyard fences, and commercial and business properties. Summit commercial iron fence panels are 6′ high and are 94" long. Installation is a cinch; simply sink your fence posts (sold here) in concrete. You can then weld the panels directly to your posts or use mounting brackets to easily attach your fence panels to the poles. Shop Summit Commercial Fence Panels!